So you know how the French are contemplating legislation that would require Photoshopped images to carry a disclaimer? 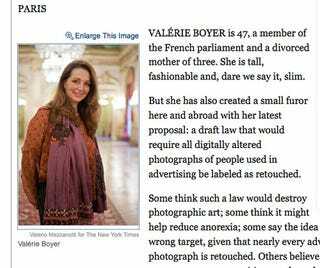 The New York Times spoke with Valérie Boyer, the French parliament member who proposed the law. Her angle is: She's a mom. "I got interested in the subject of the body because it's really a mother's reflection… It's the closeness I have to adolescents that drove me to become interested in these subjects." If someone wants to make life a success, wants to feel good in their skin, wants to be part of society, one has to be thin or skinny, and then it's not enough - one will have his body transformed with software that alters the image, so we enter a standardized and brainwashed world, and those who aren't part of it are excluded from society. Ms. Boyer recently saw a magazine headline which read: "Be who you are!" Then, on the back cover? An "obviously" Photoshopped picture of a teenager. "The pictures contradict the message," she says. She feels there's a "schizophrenia" between "the representation of an ideal world, a very thin, tanned and white-toothed woman without wrinkles," and "the plebe who has health problems, who doesn't necessarily have white teeth, has wrinkles and puts on weight." Boyer is facing lots of opposition; in the Times piece, Anne-Florence Schmitt, editor of Madame Figaro, argues: "Michelangelo painted idealized bodies, so the idea of idealized beauty was already there… It's a fake debate." Christine Leiritz, editor of French Marie Claire, exclaims: "Our readers are not idiots… especially when they see those celebrities who are 50 and look 23. Of course they're all retouched." Still, Boyer worries about the effects, especially on children — and she was also the one who tried to make "extreme dieting" a crime. "Children look a lot at the Internet… even if you're close by, even if you're attentive, even if you love them a lot, that's not enough to protect them. Especially when they target them, because pro-ana blogs are aimed at young girls in particular, they give them perverse advice, like, ‘Lie to your mother, say you're going to eat at a friend's house, cut your hair so you don't have to say that you're losing it.'" "I buy tons of women's magazines. I love fashion and I love life… But it seems to me that as a matter of professional ethics, you have to warn people that the image of the body has been modified… Do you think you have to lie in order to dream? We must treat the public as adults, and I think it's a true feminist battle. I don't understand why women's magazines aren't rallying to it."